The Order Welwitschiales contains the single monotypic family Welwitschiaceae with the species Welwitschia mirabilis. This very large caudiciform is a dicotyledon Gymnosperm. Recent treatments based on DNA analysis place the Welwitschiaceae within the Gymnosperm Order Gnetales, related to Pinales (pines). The family Welwitschiaceae contains the monotypic dicotyledon genus Welwitschia. This genus is thought to be a relict representative of an ancient group of coniferous plants with primitive characteristics, distantly related to Ephedra. It is often referred to as a "living fossil". Fossil evidence shows that it was once present in South America. Named for: Friedrich Welwitsch, Austrian botanist. The type species, Welwitschia mirabilis, from the Namib desert of South-West Africa (Angola, Namibia) has a short, central, unbranched, woody caudex up to 3ft in diameter from which grows a single pair of persistent tough, leathery leaves. These grow longer with time, from the meristem at their junction with the caudex, but loss of the apical meristem early in life prevents growth of further leaves. The ends of the leaves fray in the desert sandstorms and split lengthwise along the leaf veins, but otherwise are of indefinite length. No other permanent leaves are ever produced, although a pair of short lived cotyledons grow after germination. 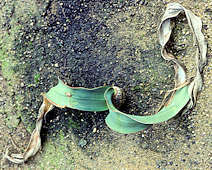 Splitting of the permanent leaves on old plants may present the appearance of multiple leaves. A long tapering taproot and a network of lateral roots extract scarce moisture from deep under the plant. The leaves are also able to extract moisture from frequent fogs. These succulent plants are dioecious, bearing inflorescences with clusters of male and female cones on separate plants. Pollen is distributed by wind and by a variety of insects that feed on it. Individual plants are slow growing and may be thousands of years old. They are sustained by dense fogs as rain is minimal, and absorb moisture through stomata on the large leaf surface. 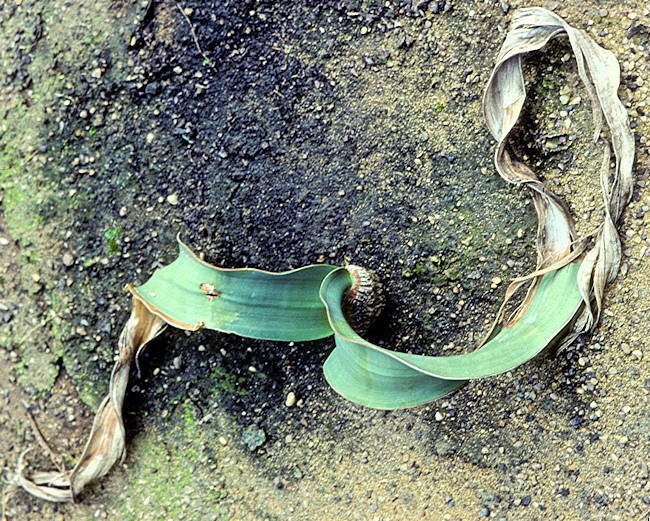 Welwitschia mirabilis, tends to grow along ephemeral water courses where at least some water may gather after brief rainfall. These plants are not truly succulent but certainly caudiciform.